Tap Room Chef Tyler Stevens (left) and GM Chris Grant pose inside the newly renovated barroom. Credit: Matt Skoufalos. The familiar neighborhood watering hole is working to branch out beyond its well-known deck bar to connect with patrons over a refreshed menu, beer list, and updated interior. The new-look Taproom includes live-edge tables from The Factory in Collingswood. Credit: Matt Skoufalos. Most of Haddon Township’s best-known watering holes wind down along Haddon Avenue, stretching to the limits of its borders with dry Collingswood and Haddonfield. But for locals in the Haddon Hills and Haddonleigh sections of town, their neighborhood bar is found on Crystal Lake Avenue. The former site of Green Valley Farms has been known by many names throughout the years, but its most recent reboot came in the past decade as The Taproom & Grill. On November 9, the locally owned establishment celebrates 10 years of its latest incarnation with a “Ten Years of Tap” party, a new-look interior, and rebooted menu. 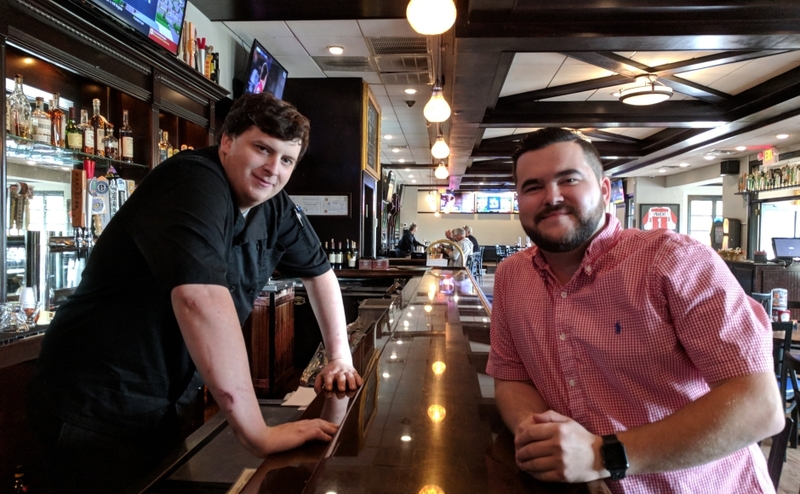 The turnover is helmed by general manager Chris Grant and head chef Tyler Stevens, alums of the PJW restaurant group. They want guests to enjoy the new-look Taproom as much for its expanded offerings as for its popular outdoor deck and live music. Central to that update are several local partnerships with breweries, food vendors, and craftsmen. 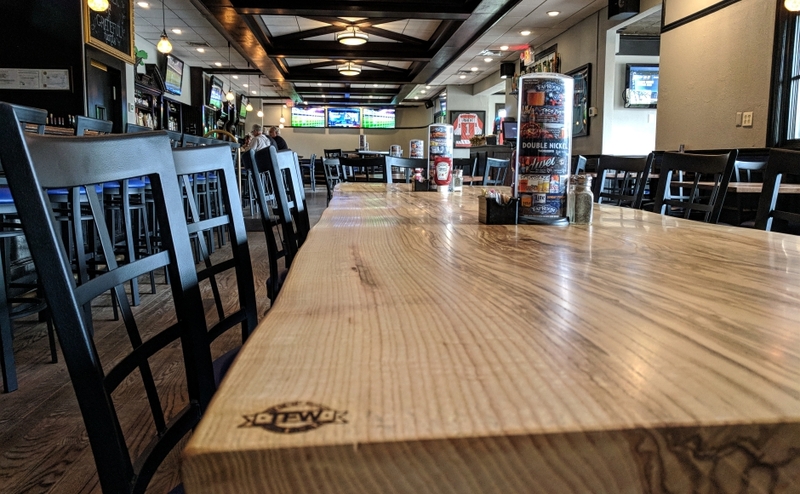 To start, Tom Marchetty of The Factory in Collingswood replaced its barroom booths and tables with black walnut tops and live-edge ash community tables. 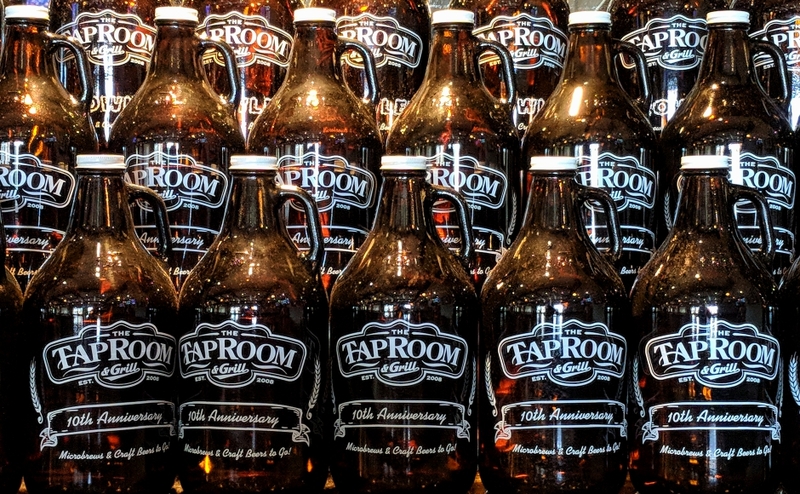 The Taproom & Grill offers growler fills as well as a pair of exclusive house beers from Flying Fish Brewing. Credit: Matt Skoufalos. Collingswood pastry chef Josue Santiago Negron of Dulce will provide seasonal, artisanal desserts, including a chocolate stout brownie and bourbon tart for the fall. Flying Fish Brewing of Somerdale is producing two exclusive house beers, a pineapple-mango Taproom IPA and Taproom hazy pale ale. In addition to a Thanksgiving-themed menu, the “Ten Years of Tap” party also debuts the Friends Giving charity beer collaboration produced by nearby Double Nickel, Tonewood, Cape May, and Urban Village breweries. “We want our food to be something people talk about,” Stevens said. Updates to the Taproom menu include (from left) smothered fries, the Southwest turkey burger, and blackened chicken salad. Credit: Tyler Stevens. The chef has redesigned the Taproom menu around its outdoor smoker, through which Stevens will extract applewood and mesquite barbecue flavors for its brisket, pulled pork, and chicken wing dishes. New items include smoked brisket nachos with queso, corn, and candied bacon; smothered French fries with pulled pork, cheese sauce, bacon, and scallions; a brioche-bun turkey burger with pico de gallo, cabbage slaw, pepper jack cheese, and chipotle aioli. 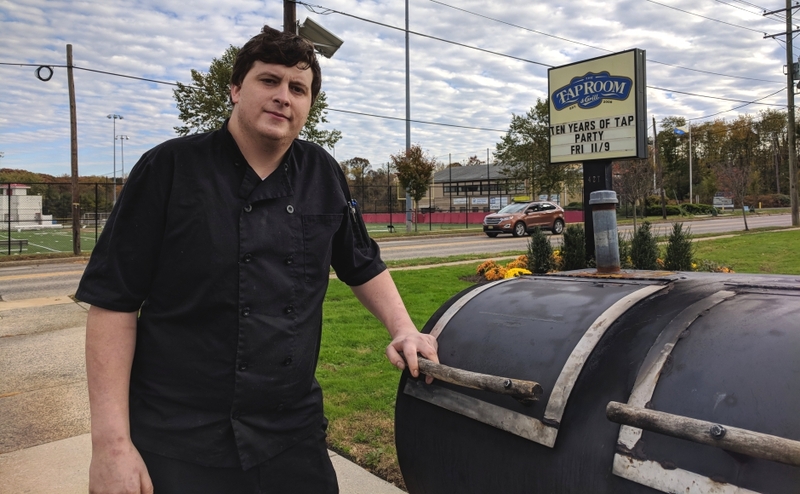 Tap Room Chef Tyler Stevens stands at his outdoor smoker in Haddon Township. Credit: Matt Skoufalos. For vegetarians, there’s the wholly plant-based Beyond Burgers, zucchini fries, and a smoked veggie wrap. Familiar staples, like the Tarantini panzarotti, flatbread pizzas, and smokehouse wings have stuck on as well. Stevens also promised fresh weekly specials, and “more obscure” items as inspiration strikes. Grant and Stevens said The Taproom will continue to focus on its beer-savvy audience—a new growler fill station will send guests home with craft beer selections—but they’d like to revive its dine-in business as well. “I would like to bring back the dinner crowd and the lunch crowd, and show people we’re not just a drinking bar,” Stevens said.